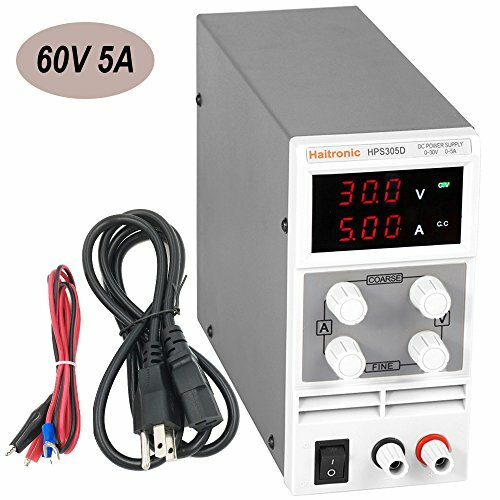 We Haitronic original Factory with traditonal B2B,We're relatively new to Amazon, but we've been a DC power supply factory in China for many years. "So far, so good and it's been working fine. So many electronic test equipment fail quickly but this one is still going!" One of our US customer feedback. This HPS605D variable DC power supply comes with rotary switches for setting up the voltage and current, maximum output voltage up to 60 volts and current up to 5 amps. With its reliability and versatility, an invaluable and indispensable tool for testing, science project etc., ideal for labs, research institutes, R & D facilities. Last but most important: Quality comes first. Any technical questions, feel free to contact us! * Up to 0~60V & 0~5A DC output for stable DC output, can meet much comprehensive DC power supply request, such as laptop maintance, DIY prototyping power supply. * Stable! Each unit, we make sure 7x24h AGING TEST before QC pass. It, can switching 230V/110V to DC0V~60V, It is single channel output, 0~5A adjustable accuracy, dual LED display. *Compact and eco-friendly! Get rid of all 1.5V/ 3.7V/ 9V etc dry cell, and lithium cell, it will never "power off". It is continuously adjustable within the rated AC 230V/110V to DC60V~0V. CV/CC working pattern switching automatically. * Safe to use! Full fuse protecting makes it safe to use: over-load protection function, overheated protection function, short circuit protection function. *Small body! easy handling, a sturdy case, novel appearance, good performance, excellent cost effectiveness. If you have any questions about this product by Haitronic, contact us by completing and submitting the form below. If you are looking for a specif part number, please include it with your message.